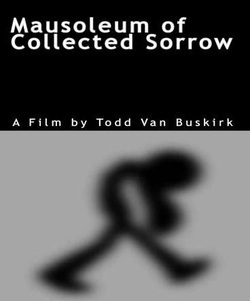 Mausoleum of Collected Sorrow - Todd Van Buskirk. Artist. What if Andy Warhol directed a film for Pixar? This film is 1 hour, 9 minutes, and 44 seconds of an animated walk cycle. Todd Van Buskirk’s description of a ‘mausoleum’ is that it is a wandering body, perhaps human, perhaps alien, perhaps both. The mausoleum of the mind, and it’s lack of color, with a body that exists in shadow only. Soundless, limitless, and endless sorrow trapped inside this walking body. With this film, Van Buskirk attempts to redefine the animated feature. Van Buskirk started this project some years ago with an assigned animated walk cycle assignment in college. Van Buskirk was given a 3D modeled character to animate using Maya software. The essence of the assignment, which earned a “C”, was animate 15 seconds of a walk cycle. This basic idea survives in the finished 80 minute feature. Van Buskirk’s films are absurd in that they focus not on logical acts, realistic occurrences, or traditional character development; they, instead, focus on characters trapped in an incomprehensible world subject to any occurrence, no matter how illogical. The theme of incomprehensibility is coupled with the inadequacy of language to form meaningful human connections.